What does hyaluronic acid consist in? Hyaluronic acid is part of our skin, and that is why it is assimilated by the organism when injected. Nowadays, it is the most commonly used material, as it is a safe and effective product, with a biosynthetic origin. In oral surgery it is used to facilitate the healing process of wounds, to repair and regenerate the gum tissue and the oral mucosa. It also impedes the contact between microorganisms/irritants and the surface of the wound, reducing the risk of infection. With the aging of the skin the cutaneous cell regeneration decreases, and the cellular tissue diminishes. The collagen fibers of the skin lose their elasticity with age and diminish, leaving as a result a dryer, wrinkled and less elastic skin, leading to the creation of the so called crow’s feet, expression lines and forehead furrows. The stabilized hyaluronic acid is a modern implant developed in Sweden, which purpose is to increase the volume of the lips and to fill wrinkles through aesthetic medicine, used by men and women who want to maintain their beauty. Through a simple technique the wrinkle is filled or the facial areas to be treated are marked. This is an effective and immediate treatment, unlike the effects of many cosmetic products, which need to be applied constantly. It is not an uncomfortable process due to the previous application of local anesthesia. For what is it especially suitable? To add volume and enhance the lip-line. This treatment can only be carried out by medical practitioners or specialized odontologist. 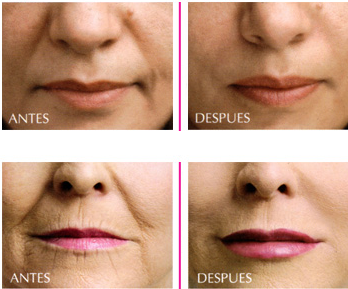 The lip enhancement, lip augmentation and the fill of facial wrinkles is carried out by medical practitioners specialized in aesthetics, applying a biocompatible and biodegradable gel that acts against wrinkles, creating volume in those areas in which a decrease of hyaluronic acid present in the organism has occurred. As it is a natural product the implant is gradually absorbed by the body, without side effects, turning itself into water and carbon dioxide.